The 2013 Blackboard Users’ Conference was held at the welcoming University of Durham. With a full programme of research and experience from around the UK both College Learning Technology Assistants, David and Stephen, were able to attend and participate in the activities. 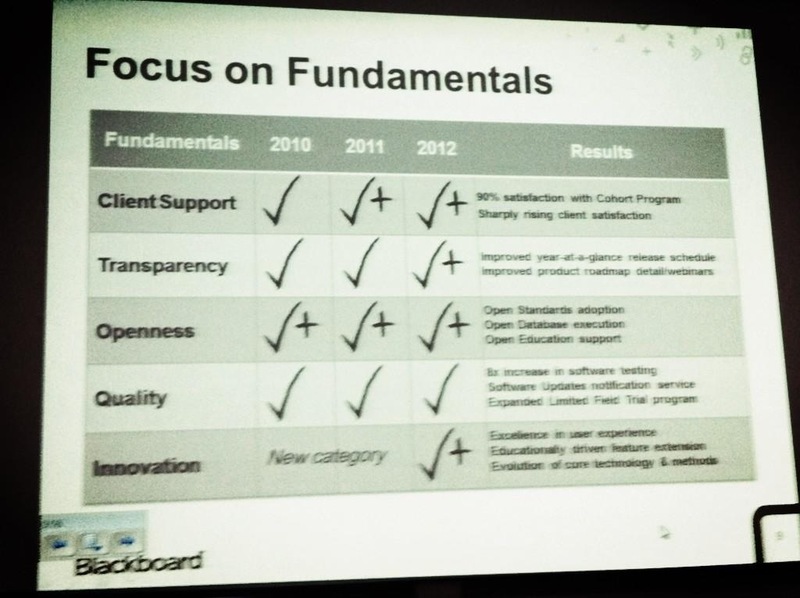 Presentations this year covered all aspects of Blackboard use, as well as a great insight from Blackboard themselves on the development of the Blackboard Learn product (of which we have version 9.2, service pack 8 at the moment). and are we, UK HEIs doing enough to protect as well as develop ourselves in the changing economic climate. Sector/Institution focus belies what is happening outside and around you – ‘look up’ and see, collaborate, crowdsource, share, consult, and network. “Learning together through objects of activity” interesting, backed up with question “do inter-relationships change in pone, unstructured environments? 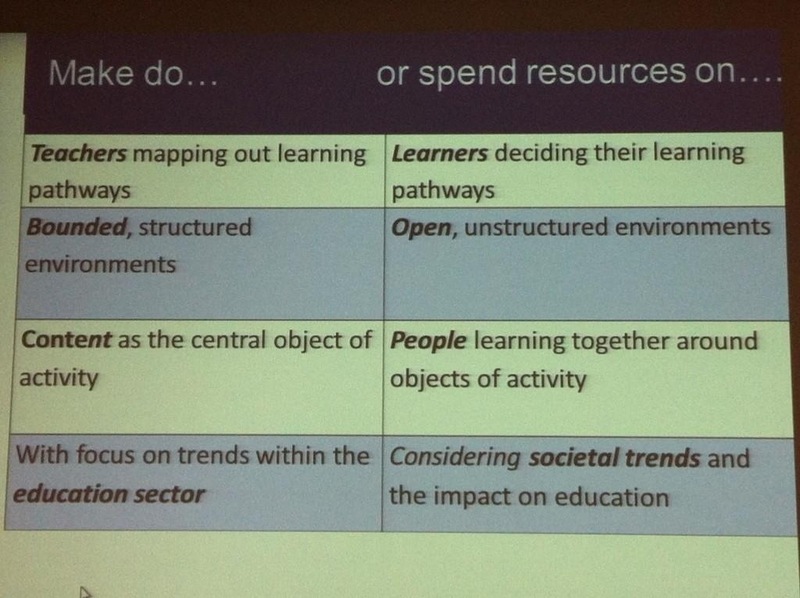 MOOC mentioned but questioned about the learning in unstructured, yet networked environments. Collective knowledge cycle: connect to a resource/person; consume; create new knowledge; contribute new knowledge back to collective. Throughout all of this, does the relationship change between academics (and therefore the Institution itself, including student support, administration, etc.) and students (attending or distance learners?). Each student will have different needs, and therefore different levels of requirement, based on attendance, background, and experience. Blackboard Analytics [product]: extract student data, from both Blackboard and Institution student-records systems, for use in reporting to different stakeholders. Student engagement & retention, the ‘active learner‘: ebooks, text messages, etc. (learner-driven support processes), identify the at-risk students who do not engage. Data-driven decision making: improve student ‘success’, optimise online and blended learning, leverage VLE investment (capacity planning, measure learning initiatives, etc. ), goal (and performance reporting) alignment, activity reporting, module/unit evaluation ‘announcement’ (desktop and mobile editions) and reporting. Student views and tweets are generally positive to Blackboard updates, changes are impressing the students and, when the changes to the discussion boards are made, will only increase! cMOOC (connectivist) and xMOOC (Udacity / Coursera / edX – Institutional led): what is the value to the distinction between each? MOOC tutoring & support is ‘light touch’ approach with low study hours per week, with certificates for completion and not credit. Udacity is more corporate association developing MOOCs (for-profit, independent of institutions). Coursera is for-profit, partnered with 33 institutions. edX is non-profit partnered with 6 institutions. “One big difference between a MOOC and a traditional course is that a MOOC is completely voluntary. You decide that you want to participate, you decide how to participate, then you participate. If you’re not motivated, then you’re not in the MOOC.” Downes, S. (2011) What a MOOC does.